Someone awhile back was able to print a picture and somehow press it onto white or beige material to add it to a quilt, can someone tell me how they did it? I'm not a quilter, but I would assume that you just put the picture on a piece of fabric to be used in the quilt. Office supply stores have T-shirt transfers that you can run through an ordinary inkjet printer. Print the photo(s) on them, iron them on the fabric according to instructions, then just treat that piece of fabric like any other quilting square. You'll find these T-shirt iron-on transfers in the inkjet/laser labels section of the office supply store/department. One other tip: When printing your photo, your printer should have an option for flipping the picture, for use on T-shirt transfers. I have used the photo transfer papers in my computer to transfer / iron on pictures onto fabric. This works well on an item that is not worn or won't need to be washed. The transfers fade and crack after washing. The best method, and I made a quilt for my granddaughter using this method is to purchase the fabric paper for your printer. It is slightly expensive, but works very well. You print on the fabric from your printer. Then you rinse out the extra ink and let the fabric dry. After that, just sew as normal. I found the inkjet printable fabric pages (printed treasure fabric sheets) at softexpressions.com. The instructions are easy to follow, including the printer settings. Hope this helps. Sorry I don't have a picture, I was showing the quilt to my sister and we packed it up to mail before I took the picture. Admittedly I have not tried the fabric paper made for computers, but am sure going to try it some time. This is how I transfer photos and anything I want from my computer to fabric. I cut freezer paper and a piece of light colored cotton fabric, usually muslin to 8.5"x11". With my iron I lay the fabric on the wax side of freezer paper and fuse the two together. Then lay the fabric side down in my inkjet printer and simply print whatever I want. After printing my picture I simply peal the paper off, it can be reused many times. 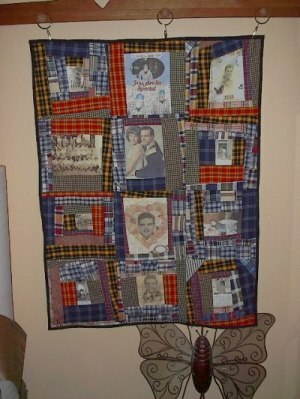 I make a lot of quilts and have made several with family pictures this way. I always put labels on my quilts, I write the label on my computer and print it out on fabric to be sewn on the back of the quilt. You can print black and white or color, whatever you can print on paper you can print on fabric. I heat set the picture with my iron after pealing the paper off. Make sure you don't have any loose strings when you send it through the printer. Micheal's Craft stores had the items needed to transfer pictures to fabric.I made granddaugthers tee shirts with pictures of them and their cousins having fun. They seemed to like them. How do I use freezer paper to make photos for my quilt? First you need a product called "Bubble Jet Set". You can buy it online. Cut your cotton fabric to 8-1/2 x 11 inches and soak in the chemical for five minutes and hang to dry. Once dry, you iron the fabric to the shiny side of freezer paper. Then you use it in your bubble jet printer to print your photos. Allow them to dry for 30 minutes, peel off the freezer paper and wash your photos in mild dish detergent and cool water. (You can also buy Bubble Jet Rinse). Dry them once more, press and they are ready to use in your project.